Sara Moulton, a Julia Child protégée, Gourmet Magazine’s executive chef, a cookbook author, and former Food Network star, will be back on TV in April. 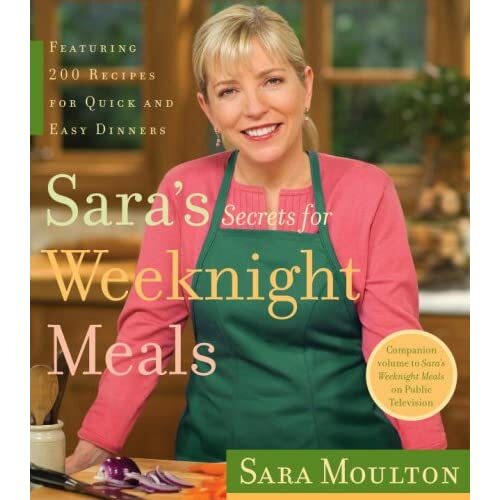 Her new show, named after her second cookbook, Sara’s Secrets for Weeknight Meals, focuses on sitting down to real dinners during the workweek. Moulton describes herself as a teacher, and it seems fitting that, this time around, she’ll be on public TV. What would you eat for your last meal? Here’s the thing: I really fantasized about this and decided I’d be very hungry. There are just too many things I would want. When I was done, I realized it was all carbs and fat. I’m really going to hell in a handbasket, but I guess that’s the point. Sounds great so far. I have to have some absolutely beautiful caviar. I’m imagining that the Russian stuff isn’t endangered, so I can start with osetra on homemade blini. I haven’t decided where to put the cheese, so I just put it at both ends. I like your style. I’ll have fondue, with the usual cheeses. Then Peking duck with lots of extra-crispy skin, and I’d like the porcini gnocchi from Union Square Café with that. Is that OK, to mention a restaurant? Sure. Good, because once I thought of that, I thought, “I’d really like to have their garlic potato chips, too.” And then I thought, “I’d really like to have Beppe’s french fries.” Have you had them? They fry them with a bunch of herbs. Yes, delicious. Yeah, so there you go. Three carbs with my low-fat Peking duck. . . . If I had to have a vegetable—I mean, I really do love vegetables, but for this occasion, I don’t know—I would have Indian-spiced cauliflower with peas. Then more cheese. Epoisses, which is my favorite cheese, with sliced baguettes. And for dessert—I don’t know what season it would be, but it doesn’t matter. This whole meal couldn’t happen at one time, but who cares? Cherry pie made with sour cherries, or a sour-cherry crumble, with brandy-spiked whipped cream. And if that’s not good enough, a few dark-chocolate truffles afterwards. And I thought about the drinks—a Veuve Clicquot La Grand Dame to start. People always serve champagne with caviar, even though they don’t go together, but who cares? It’s celebratory. Although I don’t know how celebratory this occasion really is. Anyway, I would want a nice French chardonnay, too. And at some point, a beautiful red Bordeaux. And a double espresso, maybe with the truffles. And the setting? The company? My parents have an old farmhouse in northeastern Massachusetts. We could be there. I’d love for my husband to be there. He’s my best friend. And my kids—we have a good time together, the four of us. My son, in particular, would be pleased with all these carbs. And we all like duck. Sounds perfect. Well, it’s more food that any person should eat—especially a five-foot-tall person, but whatever.